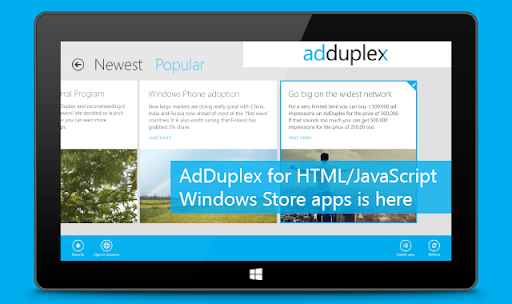 You can install the extension by searching for AdDuplex in the Visual Studio Gallery directly from within Visual Studio (Tools > Extensions and Updates > Online > Visual Studio Gallery) or just get it from the Gallery web page. We would like to thank all the developers that helped us test the SDK during the Beta period and especially those that did it during the very early days of closed beta including developers of such apps as Just Words, Jumping Squares and Cubic News. Those who participated and published their apps during the public Beta phase should see their exchange ratios bumped up too. Thank you very much and best of luck with your awesome apps!